Planning a network diagram has become a core part of managing a physical network environment. Network topology mappers act as a guide to every node, server and crevice of your network. Without a map to guide you through your network topology, it’s very difficult to run any kind of intelligent troubleshooting. No matter how sophisticated your monitoring tools are, your ability to troubleshoot is dependent upon your ability to navigate through your network infrastructure. If you can’t do this then you aren’t going to be able to address problems behind the scenes in your network. A network map provides you with a visual representation of all your network infrastructure. With this guide, you can view all of your network topology and how your devices connect to each other. You can track how devices connect to your computers, laptops, and where key elements like routers and servers fit into your overall network. In many ways a network map acts as a companion guide for network administrators who can use it to understand their infrastructure better. In the past many people would draw network maps by hand. However, as networks become more complex administrators have started to use network mapping software instead. Using a program is much better because it makes it easy to add new devices to the diagram without having to start from scratch. Users looking to simplify the diagram production process are advised to look for products with autodiscovery features. An autodiscovery feature will recognise devices throughout your network automatically and add them to your network map. This further reduces the amount of time needed to create a new map. 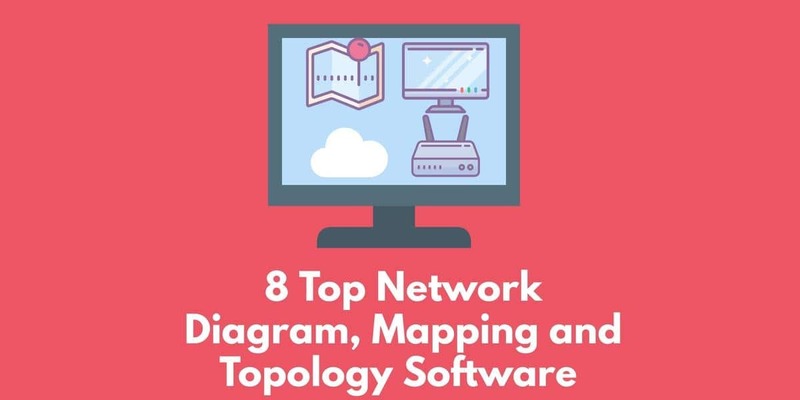 In this article we look at the best network, diagram and topology mapping software on the market (including a table of products with autodiscovery. 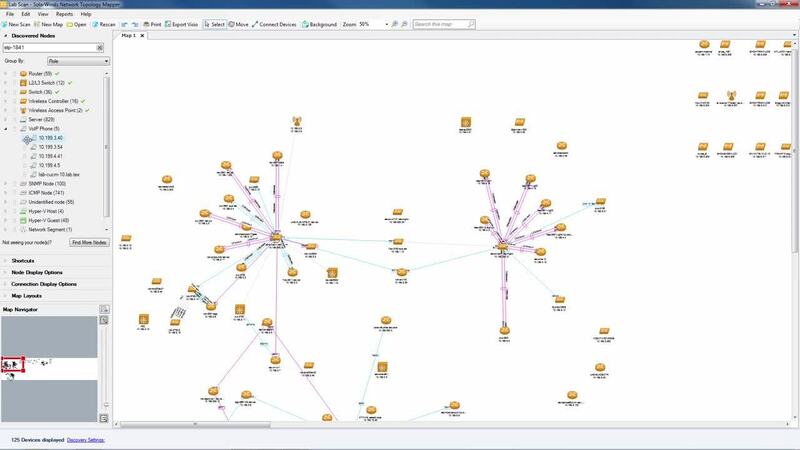 SolarWinds Network Topology Mapper is a great network mapping tool in many ways. One of the biggest draws of Network Topology Mapper is its autodiscovery ability. It can discover devices on your network automatically through the use of SNMP, v1-v3, ICMP, WMI, CDP, VMware, and Hyper-V. Autodiscovery means that you don’t have to manually configure your network devices as the program will do it for you. This is a welcome addition as it drastically reduces the initial map creation or configuration stage that you experience with non-specialist network topology products. Once you’ve created a map, you can then enter details about each mapped object to record more information for when you need it later. This can be useful for recording information for future troubleshooting. One of the concerns many network administrators have is not just drawing up a new network map but keeping up with changes as they occur. This is something that SolarWinds Network Topology Mapper has fully embraced, as it automatically scans for new devices. By automatically recognising new devices, Network Topology Mapper keeps up with your environment even if it changes. SolarWinds Network Topology Mapper is a tool best suited to mid-to-large organizations. It has all the core features needed to map a large number of devices. Its autodiscovery prowess can keep track of even the most complex network infrastructure. SolarWinds Network Topology Mapper can be purchased for a price of $1,537 (£1,135). There is also a 14-day free trial that you can download from this link here. Next up we have LanFlow. LanFlow is a network mapper for Windows that is packed to the brim with potential. All you need to do to begin creating your network diagram is to drop in your network elements. LanFlow has almost all the IT infrastructure you could think of rendered into 2D and 3D images. 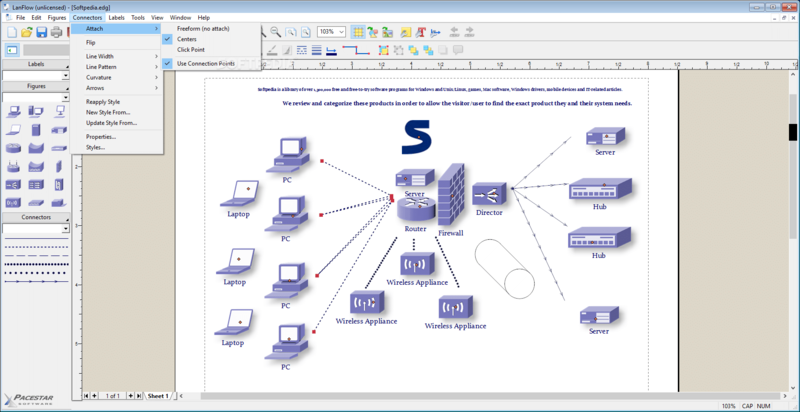 The specialist network topology diagrams make this a better pick than more generic diagram tools that can be used to stand in as network mapping tools. This is particularly true when it comes to image quality. Every diagram available on LanFlow is vector-based. Vector images are a welcome addition because they can be upscaled and downscaled without becoming distorted or unclear. Having clear images makes an administrator’s job much easier when it comes to reviewing complex topology structures. Once you’ve added elements to your network you can also start ordering them as you see fit. After dragging them to their correct location you can group objects together to start introducing your real-life layout to the mix as well. In most cases you will opt to group objects together through the use of the Connectors tab. Overall LanFlow is an excellent choice for organizations on a low budget looking to construct professional network diagrams. Though the lack of an autodiscovery feature makes it unsuitable for large organizations with complex infrastructure, it can perform very well within most enterprise level networks. LanFlow is available for $99 (£73) on a single-user license. This entry-level price rises up to nine user licenses for $639 (£471). A free trial of LanFlow can be downloaded from this link here. NetProbe is a network monitoring tool that is commonly used on account of its network mapping features. This is a Windows-based tool which works by scanning devices and allowing you to produce graphical renditions of your service quality categorising devices at one of three stages: Ok, Warning and Critical. Ease of use is something that the designers behind NetProbe have kept firmly in mind. The startup wizard helps you to kickstart the process of designing your network without bombarding you with too many complex instructions. As a network monitoring tool, NetProbe also allows you to scan your network before displaying the devices for editing. However, despite NetProbe’s great analytic capabilities it lacks vector graphics. This is a substantial drawback because it makes it difficult to zoom in on complicated areas of your technical infrastructure. For smaller organizations this isn’t much of a problem but if you’re using it to monitor a large network, things are going to become complicated very quickly. We recommend NetProbe for administrators working on Windows looking for a healthy mix of network mapping and monitoring. Given that many administrators will keep their topology guides close at hand when inspecting network elements, NetProbe can be very useful in this capacity. There are a number of different pricing options available for NetProbe. The Standard Version is available for free and supports up to eight hosts with the use of tools such as Ping, Trace-Route, SMTP Browse, DNS and Network Scan included. If you want to upgrade to monitor your network more effectively, the Pro version is available for $40 (£30) and supports up to 20 hosts. Larger organizations can opt for the Enterprise Version for $295 (£222) which supports up to 400 hosts. The Standard Version can be downloaded from this link here. 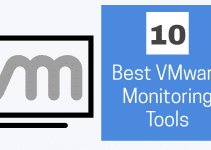 Microsoft Visio is the most well-known network mapping tool on this list. Visio has served as the inspiration for many network topology tools over the past few years. Microsoft Visio Professional 2016 operates on Windows 7 (or later), Windows 10 Server, Windows Server 2012 R2, Windows Server 2009 R2, or Windows Server 2012. Microsoft Visio operates as a tailor-made topology mapping tool as much as a generic diagram construction tool. 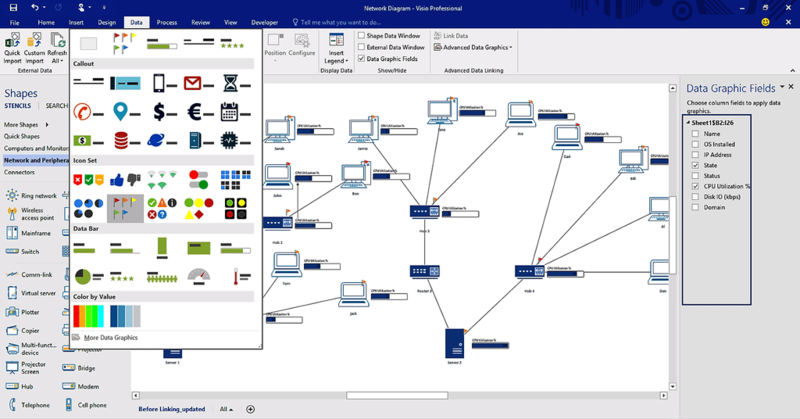 Visio’s visual elements depict everything from routers and servers to individual nodes. This platform has become popular precisely on account of its ability to detail complex network setups with striking visual clarity. The user interface and the diagrams themselves look particularly pristine. Unfortunately, Microsoft Visio doesn’t have an autodiscovery feature in place. This is disappointing because an administrator would have to attempt to map a large network from scratch before having an operational topology guide. That being said, you can achieve this through the use of an add-on called Visio Connector for Microsoft Baseline Security Analyzer. However, the lack of an autodiscovery feature remains a missed opportunity for Visio as a whole. Administrators looking for a polished and reliable network mapping tool would be well advised to consider Microsoft Visio. However, if you’re working on a large network or are looking for a device with autodiscovery potential, we advise you to look elsewhere. The Standard version of Visio is available for $299 (£220). You can also purchase the Pro version for $590 (£435) which includes over 70 templates and thousands of unique images. Microsoft Visio standard can be downloaded from this link here. Next up on our list we have Lucidchart. Lucidchart is an online network mapping software tool with a variety of features that allows you to start creating your network from scratch with the help of one of the onboard templates. This helps you to lay the foundations before moving on to customise your topology in line with your actual physical environment. As an online application Lucidchart is available for Windows, Mac and Linux. Lucidchart has become a popular tool because of its depth. Lucidchart has diagrams for a staggeringly wide range of network infrastructure from the basics right through to newer systems and cloud services. Currently Lucidchart has unique diagrams to depict network elements provided by Microsoft Azure, Amazon Web Services, and Cisco. Without a doubt, Lucidchart’s most significant advantage is its accessibility and shareability. All you need to do to use the service is to log on to your online account. Once you’re online you can then share your network diagrams with other members of your team as needed. You can even tag members of your team to respond to any questions you have about how to fix certain issues or make any improvements. There are a number of pricing options available for Lucidchart. The simplest is a Basic single user license starting at $7.23 (£5.45) per month, which provides you with unlimited shapes and up to 100 mb of storage. The next upgrade is the Pro single user license which is available for $13.27 (£10) a month. This provides you with “professional shapes” and the ability to import and export to/from Visio. There is also a team version available for $30 (£23) per month. You can sign up to use Lucidchart for free via this link here. When it comes to minimalist network mapping software, Intermapper is a solid option. Intermapper is available for Windows, Mac, and Linux and provides users with the ability to map their network through the use of SNMP scans. SNMP stands behind Intermapper’s autodiscovery tool. In a matter of minutes, you can start creating a map of your network environment that drills right down to the minutiae of your active infrastructure. Intermapper also functions as a network monitoring tool as well. You receive notifications when particular devices are in a critical state or exhibit problematic behaviour. You also receive notifications once a new device has been connected to your network. Together these features make it easy to use your network map to actively maintain your network. One standout feature of Intermapper is that of summary maps. Summary maps group particular groups of devices together so that they can be viewed in isolation if needed. For example, if you need to analyze devices within a physical site, then a summary map will allow you to do this. This reduces the amount of time needed to sift through your devices and allows you to conduct more efficient monitoring. Overall Intermapper may not have the most up-to-date user interface, but its visual shortcomings are mitigated by its potent autodiscovery feature. The main drawback of Intermapper is the price. The pricetag is extremely hefty for a product with such a basic design. Though there is a free version that can monitor up to 10 devices, the large price tag of a $303 (£223) subscription is substantial given the platform’s limitations. Likewise, the perpetual license of $765 (£576) for 25 devices is also incredibly steep given what is available. Intermapper can be downloaded for free from this link here. CADE is a basic network topology mapper and 2D vector editor. Its professional counterpart, CADE Pro allows you to create unique network diagrams from scratch and export them in EMF, JPG, PDF, and XAML. CADE Pro supports the command line to allow users to open or export specific files. CADE’s overall design is similar to Visio’s though the product website states that CADE has a number of advantages over Visio. One of the main reasons is that it can be used as a web-based application, making it ideal for teams looking for a solution that is easy to deploy. Allowing the user to choose between a desktop or application makes it easier to use CADE within an enterprise environment. have to invest significant time drawing up their network from scratch. In terms of price CADE can be downloaded for free. However, if you require CADE Pro then you can purchase CADE Pro Lite or CADE Pro. CADE Pro Lite costs $75 (£56) and supports DXF/DWG, JPG, and EMF. CADE Pro is available for a substantial $387 (£291) and supports DGN, DXF/DWG, PDF, JPG, and EMF. You can also download a 30-day free trial version of CADE Pro here. 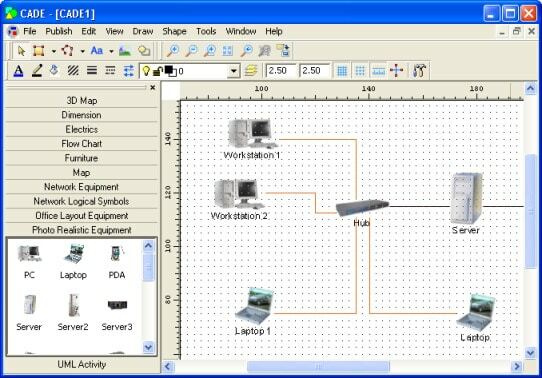 Dia is a free diagram creation tool that bears a distinct Visio influence. Many administrators are using Dia due to its simplicity. While it doesn’t have the same quality user interface of a tool like SolarWinds Topology Mapper it does have the basic visual elements to chart a complex diagram. You can create everything from network maps to flowcharts depending on your needs. With over 1,000 objects included, this tool boasts a healthy repertoire of representations for administrators to work with. In the event that you go overboard and generate a massive diagram (which is very easy to do if you’re working within a larger organization), the Best Fit feature will condense your diagrams back down to a comprehensible size. This is extremely useful for making sure that your diagrams can be understood within a live monitoring environment. Even though Dia offers the ability to construct dynamic and detailed diagrams, it lacks an autodiscovery feature. If you’re determined to go the old-fashioned route of designing your own diagrams from scratch then this is a tool worth consideration but if you want something a little quicker then you’re better off with a network mapper that works automatically. Dia can be downloaded for free from this link here. Network Mapping tools are an absolute necessity for any organization attempting to monitor its network. This is particularly true of larger organizations with diverse topology structures. 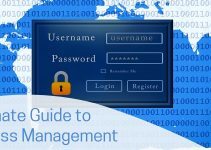 All of the tools we’ve mentioned on this list can hold their own within an enterprise environment. That being said, we recommend that you opt to incorporate a tool that uses an autodiscovery feature. Autodiscovery will reduce your manual administration time so that you can focus on other tasks. Given the centrality of this feature to swift diagram creation and subsequent updates, we recommend SolarWinds Network Topology Mapper as our top pick. The user interface is simple and allows you to run SNMP scans of your devices without running into any hiccups. While the price tag is steeper than many other products on this list, it is more than worth the price for larger organizations because it frees up lots of time. Ultimately, network monitoring is an area where time is money.